All out against White Supremacy! 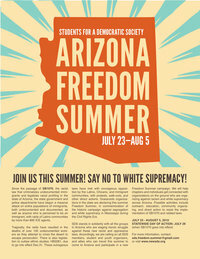 Be part of the Arizona Freedom Summer, July 23–August 5, 2010. 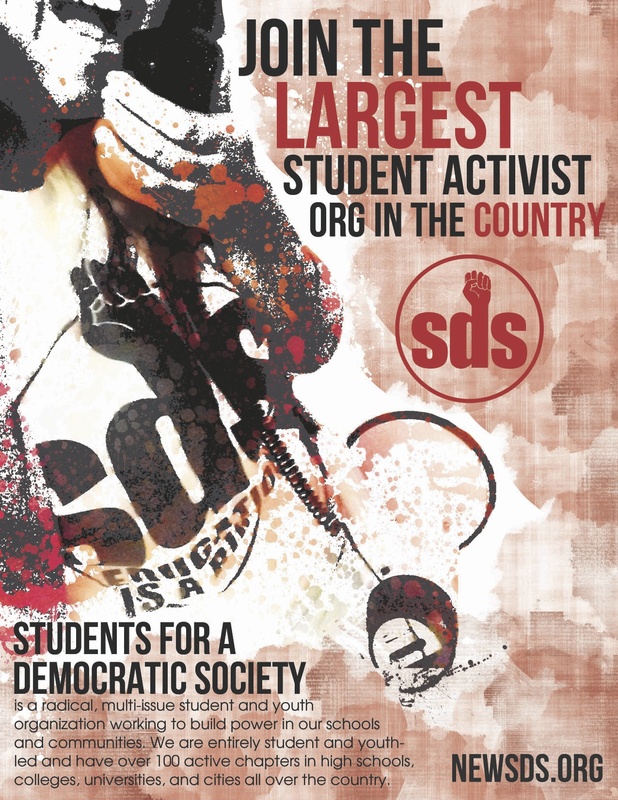 Join SDS this summer in the struggle against racism in Arizona! Come work alongside dozens of grassroots groups who are organizing against SB 1070 and other anti-immigrant laws. SDS at the U of M will be caravanning down July 27th to the 30th or 31st. Email umnsds@gmail.com to get involved in the organizing and protesting that will happen around this huge event. We need as many folks as possible, so JOIN US! The state of Arizona sits at the center of a widening humanitarian crisis along the U.S./Mexico border. For years, the U.S. Border Patrol and dangerous armed vigilantes like the Minutemen have harassed, threatened, and assaulted would-be migrants attempting to enter the United States. Immigrant workers who seek to escape them are driven ever deeper into the desert, far away from access to food, water, or medical assistance. Since 1994 an estimated 5,000 immigrants have died this way while attempting to cross the U.S./Mexico border. Since the passage this Spring of Arizona’s SB 1070 law, however, the situation has become dramatically worse. This law, enthusiastically embraced by right-wingers and white supremacists everywhere, targets the entire non-white population of Arizona for special repression from local law enforcement. Under SB 1070, police have the power to stop anyone – anyone at all – if they have a “reasonable suspicion” that they might be an undocumented immigrant. Individuals not carrying proof of legal residency on them at all times are subject to police harassment, detention, and criminal charges. Those who are in fact undocumented will be subject to immediate detention and deportation, regardless of age, family situation, or lack of criminal records. Supporters of the law might argue that “racial profiling” is not a factor in who gets stopped, but we know the truth: cops aren’t going to be stopping white people and demanding “their papers” – this new form of oppression is targeted squarely at the Chicano and Latino communities in the state, including U.S. citizens and residents. But if you have any doubts about the racist nature of the SB 1070 supporters, just look at what they did next: in May, governor Jan Brewer signed SB 2281 into law, a bill that outlaws the teaching of ethnic studies in Arizona public schools. The only history students will be taught now is that of the white settlers who forcibly took the land from the Mexican and indigenous communities originally living there. That is why SDS is joining in the call for a “Freedom Summer,” in the tradition of the Civil Rights movement, to fight back against these new laws. Between July 23 and August 5, SDS members and friends from around the country will go toArizona and join local grassroots groups to help build the struggle against SB 1070. We need your help! For more information, get in touch with the Freedom Summer Working Group at sds.freedom.summer@gmail.com. More information about organizing in Arizona can be found at www.altoarizona.com. Join us! ¡La Lucha Sigue!